Let's say you want to talk to someone in Chinese but you don't actually speak the language. This is where phrasebooks come in handy. Our phrasebooks come in many different languages and categories. Each category contains a list of everyday phrases to help you communicate with people from all around the world. To use a phrasebook, go to "Chat". 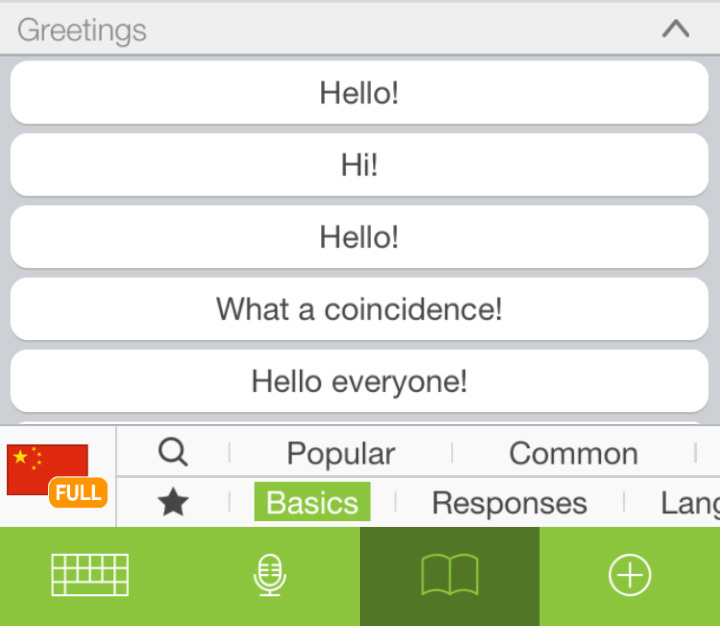 Now select a pal and in the chat screen, tap on "Phrasebook" at the bottom. Select the language you want to learn by tapping on the flag. In this example, we'll be choosing "Simplified Chinese". Then select the category "Basics". A list of topics will appear. Select a topic to see the phrases. Let's choose "Greetings". 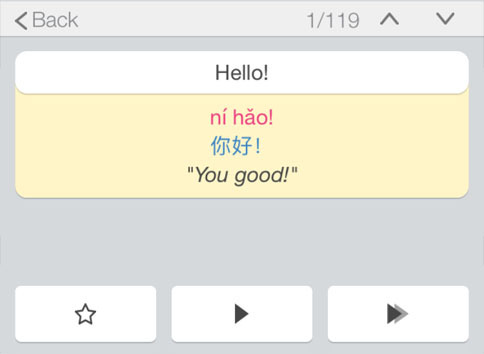 In the next screen, you will see how "Hello" is written and pronounced in Chinese. Each phrase translation is divided into three parts. Romanization (Pink) - How the phrase or word is pronounced. Translation (Blue) - How the phrase or word is written. Comments (Block quote) - A comment or usually the literal translation of the phrase. Now at the bottom, there are 3 buttons. 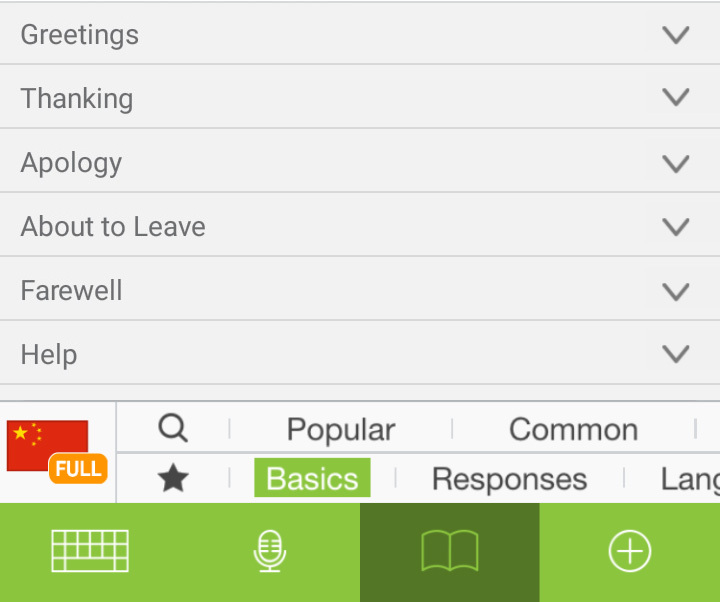 Add To Favorites (Star) - Lets you save a phrase to your favorite list. Play (Triangle) - Plays the literal recording of the phrase. Slow Play (Two Triangles) - Plays a slower version of the phrase. Once you are familiar with the phrase, you can send it as is by tapping on the "Send" button. If you want, you can record the phrase by tapping & holding the "Record" button. 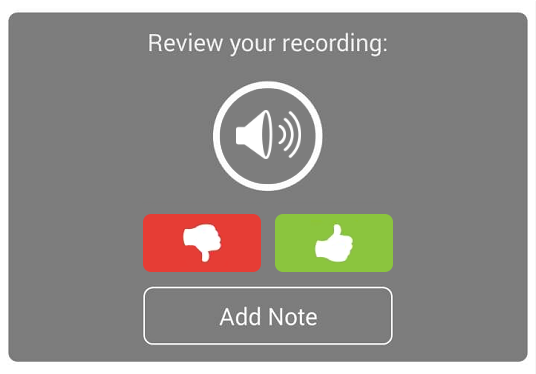 After recording, you can review the recording by tapping on Preview Button (speaker). Select "Thumbs Up" to send or "Thumbs Down" to cancel. Good job! You have just said "Hello" in Chinese! When you receive a phrasebook message, tap on the Play button (if available) to hear the recording. Tap on the green arrow button to see the pronunciation, translation, written characters or comments (if any).